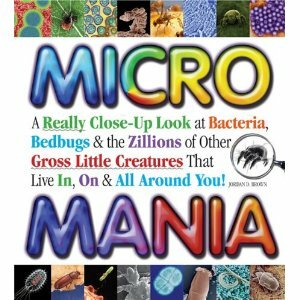 Micro Mania: A Really Close-Up Look at Bacteria, Bedbugs, & the Zillions of Other Gross Little Creatures That Live In, On & All Around You! That's Gross! : Icky Facts That Will Test Your Gross-Out Factor. Both are books you'd expect to fascinate a little boy (yep, that darn gender stereotyping again! ), but no, my sweet little princess loves them! You know how some folks find certain body parts/bodily functions like bottoms and toots to be absolutely hysterical? Well, that's Miss M to a T! She doesn't just dissolve into giggles either; nope, she whoops and hollers and is so LOUD about it! It's impossible not to laugh along with her, no matter how unfunny I generally find germs and patooties to be. Isn't it funny how different from us our kids can be? And frankly, I'd rather have her read about microbiology than be obsessed with pink and princesses! 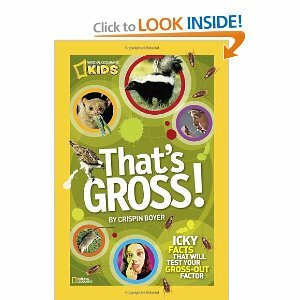 Do you have any other "gross" books to recommend for Miss M? What do your kids like to read? Strange Beginnings (Growing up series) http://www.amazon.com/Strange-Beginnings-Growing-Up-Series/dp/0439249597/ref=cm_cr_pr_product_top has been a favorite around here for years. I hadn't seen the Micro Mania book before...sounds like something my girls would love! Yep...I pulled it up and she's busy watching a video about the urinary system. And loving it! LOL! Thanks for the suggestion!